Another post about wasps’ nests and badgers, I’m afraid. The badgers do seem to dig up these nests in dry weather, presumably as an alternative food source when worms are scarce. At least, that’s what my limited records show (and those of Steve from Bedfordshire Wild). On the other hand, it may just be coincidence. 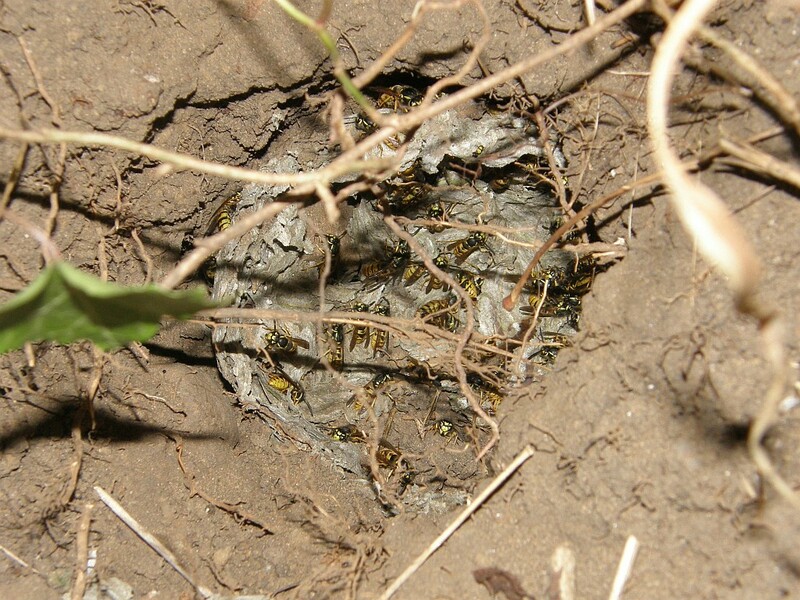 Decent-sized wasps’ nests only occur in summer. Dry spells mostly occur in summer. Perhaps I’ll look back at the archives in years to come and find a definite connection. Anyway, I mention this wasps’ nest mostly because of its location. I spotted it when my wife and I were taking Scarlett to the park – it’s on the verge of the main road through the village. I’ll admit it isn’t a huge road – it isn’t a huge village – and there is a nice mature hedgerow and pasture fields on both sides, but it was a surprise to see badger activity this close to the houses. Anyone walking home late from the pub on Saturday night would have got a shock. ‘Their habitation is even one with your guarded threshold‘ indeed. Very interesting. I’ve had to re-draw my map of badger activity in the area because of this find. When I used to fish the Weaver many seasons ago you would quite often find a wasp’s nest in the back of the peg you’d patiently set up in whilst daylight was just showing and the temperatures were still very low. Trouble was as the sun rose and the air warmed you’d start to get a steady procession of wasps past your ear if you’d chosen a ‘wasp peg’. Never stung when fishing with these behind me but funny as anything watching them steal maggots from the bait box then struggle to gain flight again (wish I’d used a camera in them days). A couple of times in the early mornings I would come across nests similar to your photo, sometimes with a host of irate wasps around, always thought it was anglers perhaps hoping to get the grubs for bait (braver than me ) but now looking at your photograph I’m none to sure.